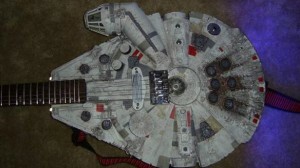 Posted in: Collectable Guitars, General. New Kings Road Vintage Guitar Emporium are very proud to offer a selection of guitars and amplifiers for sale from the collection of Ireland’s legendary guitarist, Rory Gallagher. These instruments have never been offered for sale until now. There are some great pieces that have been used live and in the studio by Rory, and this a truly unique opportunity, to purchase some of his authentic equipment. New Kings Road Vintage Guitar Emporium will be displaying the instruments for sale at their shop located at 65a New Kings Road, London, SW6 4SG. A new marketplace website, GuitarTrader.co.uk, aimed at helping shops and guitar buyers find second-hand, used and vintage items has launched. Pitching itself as the AutoTrader of the guitar world (though not in any way affiliated with that brand), GuitarTrader is essentially an online classified ad service, which hopes to provide a forum for anyone wishing to buy or sell guitar gear. The idea is that guitar players and retailers (particularly those that have little discernible online presence/catalogue) sign up to the service and list their available products, without having to setup their own e-commerce platform. It’s no secret in the guitar world that there are a lot of second-hand instruments sat in shops, or the homes of collectors without websites, so fingers-crossed the service will make it easier for players to find their ideal guitars. Sad news as Legendary UK guitarist Bert Weedon, whose books helped Eric Clapton and Paul McCartney learn to play the instrument, has died at his home in Beaconsfield. The 91-year-old musician, of Penn Road, created the popular tutorial manuals Play In A Day, which have sold in their millions. The list of rock stars who have declared that the guide written by Weedon â€“ who died yesterday â€“ gave them the first grasp of their instrument is a testament to its practical genius. It is one of the sacred tomes of the birth of British rock. It is a statement, however, that rather betrays his age. To later generations who could watch guitar heroes on video and freeze-frame chord changes, Weedonâ€™s once revolutionary approach to the instrument is already ancient history. Yet Weedon is a legend to that first rock and roll generation because he provided something vital to youngsters caught up in a storm of new music: immediacy. 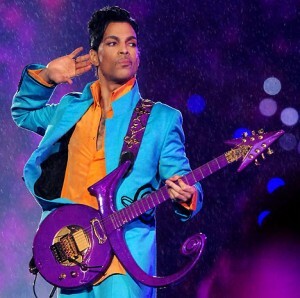 The title of his book expresses the urgency that kids felt at being confronted with the intense, primal energy of the new wave of guitar music from across the Atlantic, blowing away the horn-driven virtuosity of jazz and swing, stamping all over the solemn orchestral propriety of 1950s pop. Faced with an electric explosion at the heart of youth culture, what teen gallant could contemplate studying for years to master an instrument? These kids wanted to form bands, play gigs, pick up girls, make a noise. Bert promised to teach you how to Play In A Day, and thatâ€™s about all the time they felt they had. On a personal note I met Bert in the early 1980’s whilst working as a temporary delivery driver. He was not only very friendly to a young guitarist just starting out (me) but he also let me play his guitar, and even gave me a picture disc vinyl record as a souvenir. He was a true gent..RIP Bert. I’m posting this on behalf of the Owner, please be aware of these instruments in case they start showing up for sale.. Unfortunately half of my collection of guitars, which I have collected and hand picked for more than 25 years, has been stolen in Ystad, very south in Sweden. Most of the 15 stolen guitars are from special series, two Custom Shops are very limited. What is really outstanding is the condition of almost all instruments. Most of them are dead mint, 10,0 out of 10. Please spread the information about the burglary and the lost guitars to your partners and business contacts. A generous reward will be given to information that will give me my guitars back!! 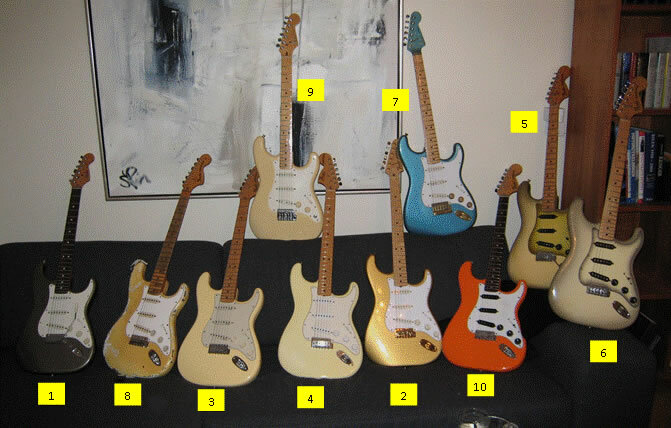 Please observe that there are only 10 guitars on the picture, but as you can see 15 instruments were stolen!! If you have any information about the instruments, or have heard any rumours, please come back to me. Your help to get the guitars back to my will be highly appreciated and generously rewarded!! A musical chimera, shrouded in the silvered mists of myth and legend, the Gibson Moderne has long been known as the enigmatic “guitar that never was”… or, was it? Designed as the third member of a trio of guitars in the new Modernist Series, prototypes of which were displayed at the 1957 NAMM show, the Moderne was originally intended to be the sibling of the Flying V and the Explorer, but never made it off the launch pad the way the other two then-futuristic classics did. Although they are iconic symbols of rock guitar today, even the Flying V and Explorer were too far ahead of their time in the late ’50s, and fewer than 200 units of both types were made in their original three-year run before deletion from the catalog in 1960. Perhaps Gibson foresaw that a third Modernist was pushing it just too far? Or did a poor early reaction to the guitar lead to its demise? Ted McCarty, president of Gibson at the time, has said a number of Modernes were made; other tales tell of prototypes and raw bodies being burned in a bonfire at Kalamazoo after early showings failed to set the guitar world alight. Whatever the real story–and perhaps it is lost forever to the mists of time–the Moderne is perhaps rarest and most elusive Gibson guitar ever created. Or was, until now. “New” from Gibson USA, the Moderne captures the look, feel and sound of the original, and puts it in the hands of players today. The Moderne is made to the precise “pre-space-aged-retro” shape that made the original so eye-catchingly hip, with elements of the Flying V’s look, but with an asymmetrical lower bout that makes the guitar much easier to play sitting down. Gibson USA dresses it in your choice of two outstanding finishes, Trans Amber and Ebony, both in genuine nitrocellulose lacquer, with the gold-plated hardware that helped the Modernist series stand out in the late ’50s. The body is crafted from solid mahogany (Grade-A beneath the Trans Amber guitars), with a solid quarter-sawn Grade-A mahogany neck glued in with Gibson’s acclaimed deep-set neck joint. The neck is carved to a slim, fast profile that measures .800″ at the 1st fret and .850″ at the 12th, and topped with a fingerboard made from exotic granadillo. 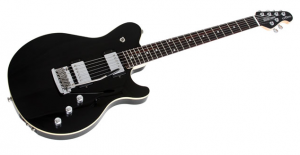 The Moderne’s headstock follows the rare split-top design, as also seen on the extremely scarce Explorer models from the first year of production. A pair of ’57 Classics captures the sound of the original PAF humbuckers loaded on Modernist Series guitars of the late ’50s. These popular pickups feature Alnico II magnets, vintage enamel-coated wire, nickel-plated pole pieces, nickel slugs, maple spacers and vintage-style, two-conductor, and braided wiring, just like the greatest humbuckers of all time. In a variation from the majority of original PAFs, however, the ’57 Classics’ coils are wax potted to combat microphony and feedback squeal at high volumes so, while vintage voiced, they are suited to high-gain playing, too. The timeless pairing of Tune-o-matic bridge and stopbar tailpiece, both in gold, anchors the strings at the body end for solid sustain and precise intonation adjustment. A set of gold-plated, vintage-style tuners with pearloid buttons retains the accurate look and performance up at the headstock. Each guitar comes protected in a plush-lined hardshell case with black exterior, and includes owner’s manual and adjustment literature, along with Gibson’s Limited Lifetime Warranty and 24/7/365 customer service. A well-known Yorkshire father and son business partnership have been given suspended prison sentences for handling stolen guitars. Richard and Justin Harrison, dealing in rare and old musical instruments, admitted to handling stolen vintage guitars worth over Â£40,000. Dad Richard, 63, of The Old Rectory, High Street, Campsall, Doncaster, admitted one charge of handling stolen goods relating to ten guitars worth Â£42,000. He was given a 12 month sentence, suspended for 18 months and 200 hours unpaid work. Son Justin, 40, of Wentedge House, Wentedge Road, Pontefract, admitted two charges of handling stolen goods, relating to two guitars worth Â£4,500. He was given a six month sentence, suspended for 18 months, 200 hours unpaid work and told pay Â£2,500 court costs. At the time of the offences they owned well known company Music Ground and had shops in Leeds, Manchester and London and international customers. They were both charged with handling stolen goods and intending or assisting in the retention or disposal of those items between October 7 2006 and March 5 last year. The guitars were part of a haul of 157 guitars stolen in two burglaries in Verona, Italy, in October 2006 and which had an estimated value in excess of Â£1million. Michael Rawlinson, for Justin, said he had not known the gutiars were stolen when he first received them but had â€œburied his head in the sandâ€. Nigel Hamilton, for Richard, said he had given the guitars to people look after when he realised they were stolen but was arrested nine months later when he was still in possession of them. Judge Christopher Batty described their actions â€œdisgustingâ€. He said: â€œWe are not talking about throw-away items. â€œWe are talking expensive property â€“ vintage guitars. The pair now face an investigation under the Proceeds of Crime Act. A nice interview has recently been posted with George Gruhn. The world of guitars has a select few gurus who have reached a place where they offer a foundation of expertise. 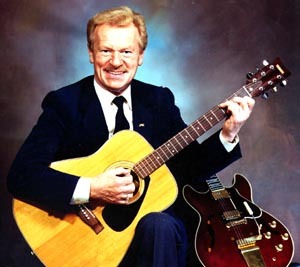 In the world of vintage guitars, the name that always comes to mind is George Gruhn. Certainly, there are others with vintage guitar expertise and backgrounds that we can consult for enlightenment. But, if you want the highest level of credibility, you turn to George. Gruhnâ€™s expertise is highlighted in the books he co-authored with Walter Carter, including Gruhn’s Guide to Vintage Guitars , along with follow-up editions on Acoustic Guitars and Other Fretted Instruments: A Photographic History , and Electric Guitars and Basses: A Photographic History . George has also written numerous articles for guitar magazines, as well as publishes his own Gruhn Newsletter. He has also been a featured columnist for Pickinâ€™, Frets, Bluegrass Unlimited, Guitar Player and Vintage Guitar Magazine. Posted in: Books and Reference Material, General. A rare amp once belonging to the late George Harrison — and used for several Beatles recording sessions — will be sold at auction on December 15 at Bonhams in London, England. The amp, a Vox UL730, was used during recording sessions for Revolver and Sgt. Pepperâ€™s Lonely Heart’s Club Band. Its connection to the Beatles and Harrison — who died 10 years ago today — has been discovered only recently. Peter Hook of Joy Division and New Order borrowed the amp from the current vendor in February 2011, as his guitarist needed a vintage amp for a recording session at Blueprint Studios in Salford. It developed a fault at the end of the session and was taken to a specialist engineer to be fixed. When the amp chassis was removed from its case, the engineer noticed “George Harrison” scratched onto the chassis. After further inspection, he found a label on the inside of the speaker cabinet. Subsequent research led to a photograph of Harrison and The Beatles in the studio with a UL730, with visible chalk markings similar to those seen in the cabinet that will appear at auction. A member of The Merseybeats who used to write the “Beatles Gear” pages for the monthly Beatles Book magazine, and who attended many Abbey Road Beatles’ sessions as a guest, has also identified this as Harrison’s UL730. The guide price at the Bonham’s auction is Â£50-70,000 and will be auctioned on 15th December in London. A collection of vintage guitars owned by the Hollywood actor Richard Gere has been sold at a Christie’s auction in New York. 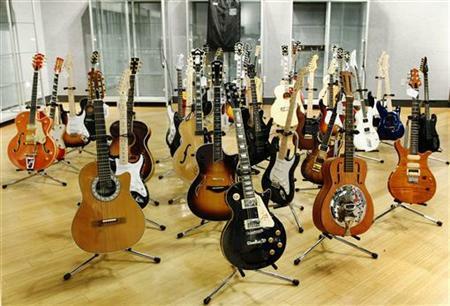 The sale featured 107 lots, including guitars and amplifiers, which Gere had amassed over a 20-year period. In all the sale raised $936,438, with all but 4% of the lots sold. The sale’s top-selling lot was a classic 1960 Gibson Les Paul, which beat its pre-sale estimate of up to $90,000 to sell for $98,500 to an anonymous bidder. Other notable lots included a 1931 Martin D- 28 acoustic model which sold for $62,500, a 1958 Gibson Flying V which sold for $74,500 and a 1934 archtop built by John Dâ€™Angelico which sold for $20,000. 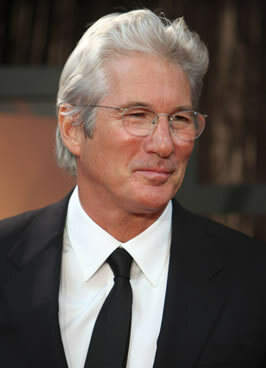 Gere, who is a well-known advocate for AIDS charities and a supporter of Tibet, will donate the proceeds of the sale to a number of charitable foundations. With the U.S. Fish and Wildlife Service raiding Gibson’s Tennessee factories again recently, This article is well worth a read, as it has consequences for any owner of a vintage wooden instrument. 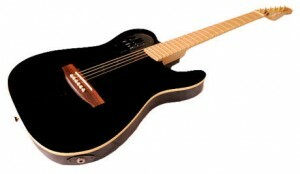 Electric guitarists often own an acoustic or two as well, but many who are used to electrics find the transition between slim, ergonomic electrics and big, bulky acoustics to mean that playing acoustic is much more difficult, especially when combined with the heavier strings and increased tension of an acoustic guitar. However, a solution became available in 1989 when the French-Canadian company Godin (established since 1972) introduced a new line of guitars. They were acoustic and lacked magnetic pickups, but had slim, Telecaster-shaped bodies which were chambered but did not have any external soundholes. From a distance the new guitar (christened the Acousticaster) looked like any other Fender Telecaster (it had a chambered maple body with a spruce top, bolt-on maple neck and maple or rosewood fingerboard) but had traditional acoustic wooden bridges with inbuilt piezo pickups provided by L.R. Baggs. Part of the Acousticasterâ€™s surprising resonance for a small guitar came from the use of eighteen metal â€œtinesâ€ (prongs or forks) inside the body, which are similar to tuning forks and resonated in sympathy with the guitar. The piezo system was controlled by an EQ on the top bout of the body, featuring four sliders (controlling gain, bass, mids and treble) for finer tonal adjustments. The guitar was different from normal acoustics in that it was slimmer and smaller, and used ordinary electric guitar strings to facilitate bends that were out of reach of traditional acoustic guitarists. It also put a wider range of notes at the guitaristâ€™s disposal. Where acoustics generally feature 20 or 21 frets, the Acousticaster was able to match the Gibson Les Paul with 22 frets. A few different finishes were initially available, and according to a 1989 review in Guitarist magazine these included black, white, natural, turquoise and cherry sunburst. It appears that natural and black, however, were the two most popular colour choices. While many of the guitars I have written about from this time period were unsuccessful and are largely quite rare now, the Acousticaster is a resounding success story. 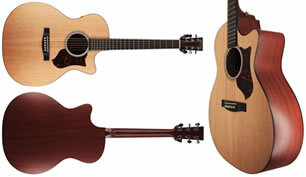 Godin continues to have an extensive range of guitars and the Acousticaster remains part of the line-up. It is still made using the same construction methods and woods. New Acousticasters sell for around the Â£1000 mark, and used examples for anywhere between Â£300 and Â£700. A Halifax, NS businessman is hoping musicians from all over New Brunswick, Nova Scotia and P.E.I. will dig through their closets for old guitars, amplifiers and other gear and bring it all to Moncton for a unique swap meet. The swap meet is set for Saturday, May 7 at the Moncton Lions Centre on St. George Street from 11 a.m. to 4 p.m.
Stuart Lorriman, a long-time musician who recently retired as a sales rep for Canadian-made Godin guitars, says a similar event in Halifax attracted over 700 people, many of whom brought all kinds of used guitars, new guitars, amplifiers, effects pedals and other stuff that musicians go ga-ga over. He chose Moncton to stage the first swap meet in New Brunswick because of the central location, making it easy for people to come from Fredericton, Saint John, Miramichi, P.E.I., and other parts of New Brunswick. The concept of the swap meet is pretty simple. Bring guitars, amplifiers and other stuff you’d like to trade, and of course some cash if you find something you’d like to buy. Mr. Lorriman says the swap meet is a place where musical instrument dealers can showcase their new products, and where collectors can sell or trade. People with two or three items can bring them in and look for something to trade, but anyone with more than that is asked to rent a table for $30. Admission at the door will be $3. Mr. Lorriman can be reached by e-mail at audiorep@ns.sympatico.ca. Local music stores have been invited to set up tables, but encouraged to put in some of their used gear or stuff that’s on sale – as opposed to taking stuff off the shelf at the store and putting it on a table at the swap meet. In recent months, local music stores have become more open to taking trades on guitars, amplifiers and other gear as musicians look to trade in their old guitars for new ones. This also opens the door for newcomers to pick up a used instrument at bargain prices. Beginners looking for a new or used guitar should plan to spend about $150 to $200 for something good. Higher-end guitars can go from $500 to more than $1,000. In Metro Moncton, the best places to go guitar shopping for new instruments are the Long & McQuade music store on Plaza Boulevard and La Guitare on St. George Street. Both stores also take trades and have a selection of used gear. 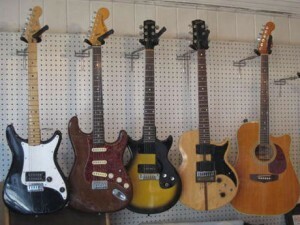 The Parlour pawn shop in Mountain Road also has a good selection of used guitars, amps, effects pedals and other stuff for sale and trade. Treasures and Trash also offers some used music gear. But Mr. Lorriman is really hoping that some unique pieces of vintage gear will make it to the swap meet. The term “vintage” is rather loose when it comes to guitars and amps, but it generally applies to anything that can be dated back 25 years or beyond. In guitar circles, vintage instruments are generally considered to be better made and sound better. Some people like them to be scratched up, others like them restored. Mr. Lorriman says guitars from the 1950s and early 1960s are the most sought after by collectors, mainly because they were made by hand by true craftsmen. As the popularity of guitars soared from the 1960s through the 1980s and beyond, well-known guitar makers set up factories for mass producing the instruments. They also began producing economy lines. For example, Fender guitars are probably the best known, especially for their Telecaster and Stratocaster models. Fender still makes guitars in its California factory, but they are also made in Mexico. Guitars from Fender’s economy line, Squire, could come from plants in Japan, China or Indonesia. To the untrained eye, a Fender Stratocaster and a Squier Stratocaster are virtually identical, but the price difference could be several hundred dollars. Fenders have been on the market for more than 50 years, so there are a lot of them out there – new, used, modified, customized and some beaten to death. Collectors go wild searching for models from the 1950s or 1960s, and prices on Internet sites can skyrocket. For example, a nice 1959 Strat on Ebay has an asking price of $15,000, when a brand new one off the shelf sells for about $1,500. A new Squier Strat could be found for as low as about $150. The folks at Fender, recognizing an opportunity, put out a “Road Worn” line of guitars that are brand new but scratched, sanded and beaten up to look like instruments that have many years of service. Mr. Lorriman says real vintage instruments from the trusted brand names were made with superior workmanship and parts. The types of wood, the internal construction, the quality of metal and electrical components like pickups, and even the type of finish can all have an affect on the overall sound of the instrument. A few nicks and scratches won’t affect the sound and actually give the instrument character. But if the neck is warped and the bridge is pulling away from the body, it could be doomed. I know hobbyist musicians who have closets full of guitars and every once in a while they’ll gather up four or five and trade them in on something else. Collectors usually like to have a bunch of guitars that have different sounds, so one is good for playing hard rock style while another would be better suited to blues or country. Serious blues players will usually have at least one guitar with the action (the space between the strings and the fretboard) set very high for playing with a bottleneck slide. 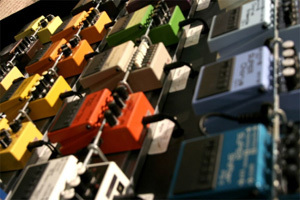 Guitarists might also have one set up differently or set to an odd tuning.? And then there are amplifiers, PA systems and effects pedals. That’s a whole story in itself. The love of vintage guitars isn’t new, but Mr. Lorriman says it has really picked up with the advent of online shopping and TV shows like American Pickers and Pawn Stars. If you have an old instrument or amplifier, write down the make, model and serial number and then go searching online to find out when it was made and whether it is valuable. But like anything else that is vintage or collectible, the true value is really what someone else is willing to pay. But it’s fun to look. Sixty-one rare and vintage guitars worth up to Â£50,000 each are being searched for by West Yorkshire Police after they were stolen. Police want to track down the rare Fender, Gibson, Gretsch and Rickenbacker models which are missing. A total of 157 guitars worth more than Â£1m were stolen five years ago, 96 have since been recovered. Two men aged 63 and 41 have been charged with handling stolen goods in connection with the investigation. Police have released images of theÂ 61 missing guitars and their serial numbers. Det Con Chris Lord from West Yorkshire Police said: “Anyone found with one of these guitars in their possession could be charged with handling stolen goods. The police said they were unable to provide more information about the burglary because of legal proceedings. Eric Clapton’s recent guitar and amplifier auction has raised Â£1.3 million to continue funding his “Crossroads” rehab clinic in Antigua. More than 130 lots were auctioned from his archive including a number of guitars he played live and on record, plus a vast collection of amps, speakers and even suits. Highlights of the sale at Bonhams New York included a 1948 Gibson which sold for Â£51,000 – three times its estimate – which was used on one of Clapton’s solo blues albums. An intricately decorated mahogany Zemaitis – inlaid with pearl – went for Â£47,000. 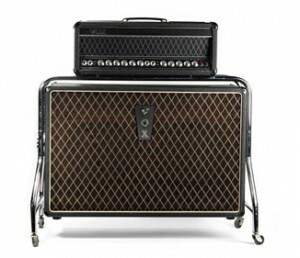 Custom-built 1997 Fender Twin Amps – created to ensure his favourite vintage 1957 speakers did not get damaged on tour – fetched four times the estimated price, selling for Â£26,000. The copies exceeded the Â£24,000 paid for Clapton’s original amps in the sale. Money from the sale will go towards the Crossroads Centre in Antigua, which Clapton founded in 1998 to help treat drug and alcohol addiction. He has previously held auctions in 1999 and 2004. Coachella, CA (January 12th, 2011) — Ernie Ball Music Man today announced that it will unveil The Game Changer, a ground-breaking, all analog pickup switching system that unlocks an extensive library of natural guitar tones previously unavailable in traditional pickup technology. Available in select Reflex guitar and bass models in 2011, this progressive innovation leads a host of new and exciting products Ernie Ball is set to launch at the 2011 Winter NAMM Show. The Game Changer fundamentally changes the guitar player’s experience. Rather than relying on pre-set pickup configurations traditionally provided by instrument manufacturers, The Game Changer gives guitarists unrestricted access to a vast library of tones via a true analog pickup switching system. Available on select Music Man Reflex models, this patent-pending system electronically rewires a guitar or bass instantly, combining any order of pickup coils in series, parallel, and in or out of phase to create tones unique to the individual creating them. Imagine having complete tonal control of your instrument with more than 250,000 pickup configurations*, without rewiring anything. With The Game Changer, the audio signal is never digitized or modeled in any way, providing a transparent analog signal path for the absolute purist. In conjunction with The Game Changer website (www.gamechanger.music-man.com), musicians can also create, save and share their tonal selections with other players from around the world. The Game Changer is currently offered in Music Man H-H, H-S-H Reflex guitar models, as well as the Music Man H-H Reflex bass model. Inside the Fender Custom Shop..
A tour around the Fender Custom Shop..
Vintage Guitar magazine has released a list of the 10 most valuable production-model electric and acoustic guitars. Using data accumulated in the research for The Official Vintage Guitar Price Guide 2011, the list includes only guitars that were originally offered in manufacturer product lines. It does not include custom-made and/or celebrity-owned instruments. 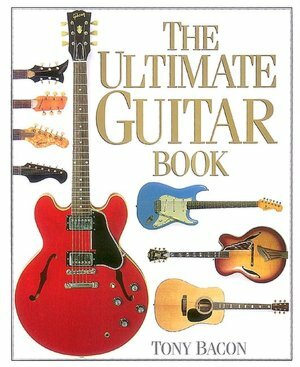 “Guitars are an American pop-culture icon,” said Alan Greenwood, publisher of both the magazine and the Price Guide. “And through the years, certain guitars have, thanks in part to players, songs, and the laws of supply and demand, become exceedingly valuable to collectors. The 1936-’39 Martin D-45 ($320,000 to $400,000) – Vintage Martin dreadnoughts are considered the pinnacle of steel-string acoustics, and those given the Style 45 details are the top of the line. 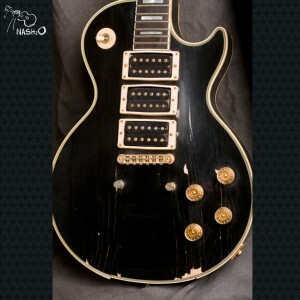 The 1958-’60 Gibson Les Paul Standard ($300,000 to $375,000) – The status of Gibson’s Les Paul changed dramatically with the 1966 release of John Mayall’s Blues Breakers featuring Eric Clapton. Then Michael Bloomfield started playing one, which influenced other top-tier guitarists of the late ’60s. The 1958-’59 Gibson Explorer ($250,000 to $310,000) – Part of an attempt to market “modernistic” guitars in the “space age,” it got little attention from buyers, so production numbers stayed very low. The 1958-’59 Gibson Flying V ($200,000 to $250,000) – Another of Gibson’s “modernistic” guitars, it was offered for only two years (1959 and ’60). The 1931-’36 Martin D-28 ($140,000 to $170,000) – Though not as fancy as the D-45, its $100 price tag was still high in the midst of the Great Depression. The 1938-’42 Gibson Super Jumbo/SJ-200 ($90,000 to $120,000) – Gibson’s answer to Martin’s D, it was larger, showier, and wound up in the hands of many a big-screen singing cowboy. 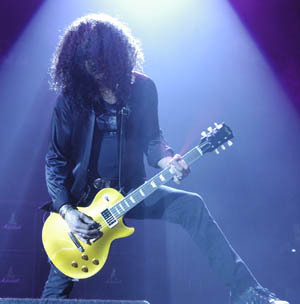 The ’57 Gibson Les Paul model ($86,000 to $106,000) – Gibson’s original Les Paul, the “goldtop” was refined until it peaked in ’57, when it was used to launch the company’s new “humbucking” pickups. D’Aquisto archtops ($75,000 to $100,000) – Luthier James D’Aquisto mostly built to order, and his rarest models bring a premium. 1950 Fender Broadcaster ($68,000 to $86,000) – Leo Fender’s original single-cutaway design has a simple, workingman’s appeal. 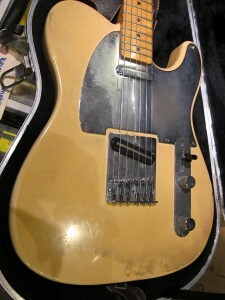 Known today as the Telecaster, it’s one of the “big three” collectible electrics. 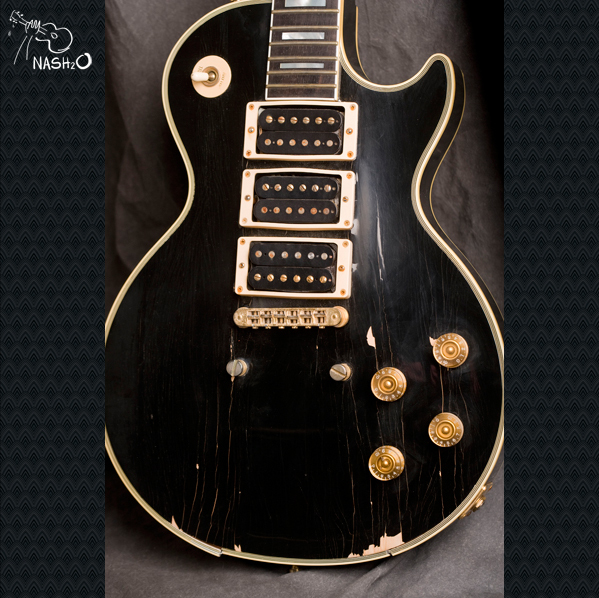 1957-’60 Gibson Les Paul Custom ($66,000 to $81,000) – With a black finish and gold-colored hardware, it was the fanciest version of the original Les Paul guitar. For more information, contact Ward Meeker, Editor, Vintage Guitar, at vguitar@vintageguitar.com, or 800-844-1197. 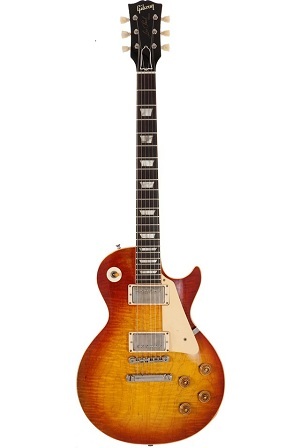 To view and/or download high-resolution images of guitars from this list, go to https://www.vintageguitar.com/priceguide/top-ten-2011. Eric Clapton is to sell off part of his extensive guitar collection to raise money for his rehab clinic. Highlights of the sale will include a guitar the musician played at the Cream reunion shows in 2005, estimated to sell for more than Â£13,000. More than 150 lots will be auctioned in the New York sale next year. Money raised will go towards the Crossroads Centre in Antigua, which Clapton founded in 1998 to help treat drug and alcohol addiction. The sale will also feature a vast collection of amps and speakers, including a pair of Marshall speaker cabinets. Used during the 1970s when the star was performing with Derek And The Dominos, it is expected to fetch more than Â£5,000. Guitars donated by Jeff Beck, JJ Cale and Joe Bonamassa will also go under the hammer. Clapton has previously held auctions in 1999 and 2004. In the latter, Clapton’s treasured Fender Stratocaster – called “Blackie” – fetched a record $959,500 (Â£607,500) at auction. Items will go on display at Bonhams in London from 23 to 26 January before the sale on 9 February. 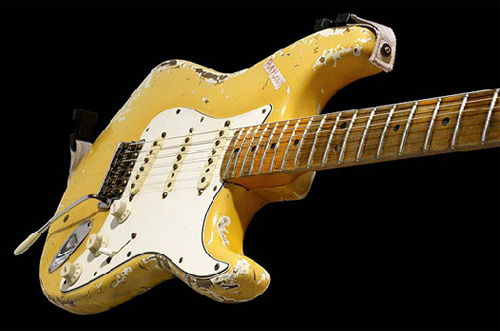 Hendrix Fender Duo Sonic Sells for Â£164,000! 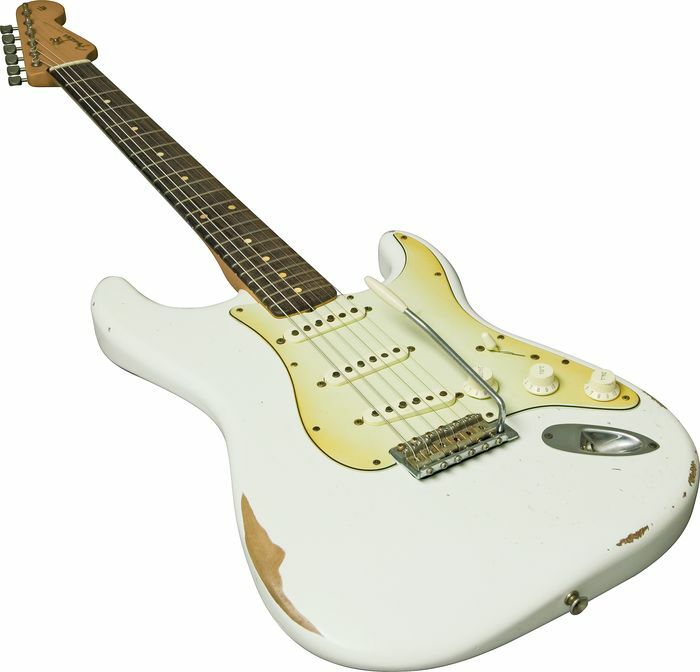 As posted the other day, the tan coloured Fender Duo Sonic, played by Hendrix before he was famous, fetched Â£164,675 at an auction today, over 400 times the price he originally paid. The starâ€™s early guitar sparked a bidding frenzy at the Cameo Auctioneers Records’ Music and Memorabilia auction in Midgham, Berkshire. 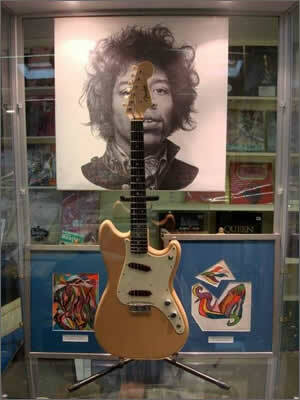 Hendrix had paid just Â£100 for the tan guitar when he was an unknown 21-year-old backing musician. Going by the name Jimmy James, he used the 1959/60 model from March to November 1964 while performing with the Isley Brothers. Two original pieces of Hendrix artwork from 1967 were also sold for a total of Â£17,400. Another Hendrix guitar is up for auction next month, this time the it’s the Fender Duo-Sonic he owned and played before he was famous. Jimi played on this guitar on tour with the Isley Brothers and it is expected to fetch around $180,000. The blond Duo-Sonic is a 1959 or 1960 model, which the 21-year-old Hendrix paid $160 for before joining the Isley’s as a session man on their tour of 1964. Of course, as a solo artist, Jimi was known primarily as a Strat man, which explains why this Fender went into storage before reappearing in Hendrix manager Chas Chandler’s studio. Chandler sold the guitar in 1982 for Â£400 to music agent and manager Rod Weinberg. The Duo-Sonic goes under the hammer at Cameo Auctioneers Records’ Music & Memorabilia Auction on November 2. Here’s a nice video by my buddy Nicolai from Vintage and Rare. This is probably the largest collection of brown 1970’s Fender guitars in the world, including a tasty brown Starcaster in the back row..not a colour I have ever seen before on the Starcaster, which is rare in any colour! The collection is for sale, but only as a collection..Bob won’t split out individual pieces. On Saturday, October 30 at 4pm, Spealâ€™s Tavern in New Alexandria, PA will unveil a permanent museum display of unusual, handmade cigar box guitars. The Cigar Box Guitar Museum was compiled and documented by Shane Speal, a York PA musician billed as â€œThe King of the Cigar Box Guitarâ€ and central figure in the upcoming PBS documentary, Songs Inside the Box. The collection of over 35 cigar box guitars displayed at Spealâ€™s Tavern were built by craftsmen all over the country and range from simple, one-string primitive instruments to complex, electrified guitars with frets, double-necks and whammy bars. Cigar box guitars are the first instruments played by many blues and rock legends such as Lightninâ€™ Hopkins, Carl Perkins and even Jimi Hendrix. The legend is told when poor folk wanted to play guitar but couldn’t afford one, they would craft one from an empty wooden cigar box, a discarded stick and baling wire for strings. This poverty instrument is witnessing resurgence in modern times with the success of old time music such as O Brother Where Art Thou and the do-it-yourself spirit brought on by the Recession. Spealâ€™s Tavern has recently gone under new management by Dan Speal of Saltsburg, PA, a retired schoolteacher and a third generation Speal to run the pub. Spealâ€™s Tavern opened its doors at the close of Prohibition in 1933 and has been in business ever since. With new organization comes a new addition of a live blues stage to Spealâ€™s Tavernâ€™s charm, along with a total transformation of the dÃ©cor, which features the Cigar Box Guitar Museum display. 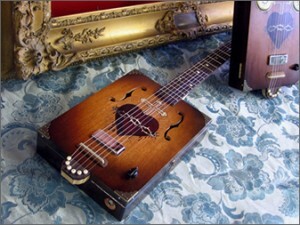 Shane Speal built his first cigar box guitar in 1993 and has been performing with them ever since. He has brought the instrument into a new renaissance with his website, www.CigarBoxNation.com, which boasts 4000 members worldwide. Seventy years after his birth and three decades after his untimely passing, John Lennon’s message of peace continues to touch the masses, and his songs still resonate in the hearts and minds of fans around the world. At the request of Yoko Ono, Gibson Acoustic is very proud to offer three 70th Anniversary John Lennon J-160E acoustic guitars to celebrate the legacy of this extraordinary artist. Accordingly, only a very limited number of these handmade acoustics will ever be available. Born on October 9th 1940, John Lennon still remains one of the most significant voices in the music of our times. In 1962, John Lennon was still an up-and-coming artist, and though one of two main singer/songwriters at the heart of The Beatles, was scraping by on the little money the band was bringing in at that time. For his first quality American acoustic/electric guitar, Lennon had his sights set on a new Gibson J-160E â€“ the problem was, he didn’t have the money to buy it. With the aid of a co-signed purchase from Beatles manager Brian Epstein (who also co-signed for band mate George Harrison’s J-160E), Lennon made the guitar his own, and put it straight to the business of making rock and roll history. Recreated by the luthiers at Gibson’s Montana acoustic guitar facility in period-perfect detail, the 70th Anniversary John Lennon models are available in three distinct versions to represent the instrument at three periods in Lennon’s life and career. Each version is an accurate rendition of the J-160E of 1962, a guitar originally released in 1954 as one of the world’s first successful “electro-acoustic” guitars, with built-in pickup and electronics and ready to hit the stage for the professional performing musician. Beloved by Lennon, and kept close throughout his too-short life, the 70th Anniversary John Lennon J-160E is a guitar every Beatles fan will want to make their own. The first, finished in Vintage Sunburst and limited to 500 guitars, represents the guitar as it was when Lennon first acquired it and used it on several famous Beatles recordings from 1963 to ’64, including Please Please Me, With The Beatles, and A Hard Day’s Night. Additional specs of the 70th Anniversary John Lennon J-160VS include a 70th Anniversary John Lennon MOP signature on the headstock, 1960s laminated Sitka Spruce top, mahogany back and sides, the classic vintage sunburst lacquer finish, Jumbo 1960s frets, Gibson authentic P-90 pickups, a historic adjustable bridge, and a 70th Anniversary mother-of-pearl engraved 12th fret birthdate of John Lennon. MSRP is $4728. The second is a stunning Custom Shop “Imagine” model in a Soft White finish personally requested by Yoko Ono to reflect the sentiment of John’s life and music during the recording of Imagine. The white Gibson Acoustic â€œImagineâ€ model includes an anniversary John Lennon Abalone headstock signature, 70th Anniversary MOP engraved 12th fret birthdate of Lennon, 1960s laminated Sitka Spruce top, historic Gibson ladder bracing pattern, mahogany back and sides, Jumbo 1960s frets, historic adjustable bridge, Gibson authentic P-90 pickups and a custom hardshell case. MSRP on the Imagine model is $10,748. The third is the model as it is today, on display at the Rock and Roll Hall of Fame in Cleveland, with a thin, natural finish and Lennon’s famous “John and Yoko” caricature sketches, representing the appearance of the guitar during the famous Lennon-Ono “Bed-In” peace protests of 1969. The guitar specs of the Gibson Acoustic Lennon Museum J-160E model includes a Gibson Custom Shop label personally signed by Yoko Ono, authentic recreation of John Lennonâ€™s Bed?In Caricature Sketch, 70th Anniversary John Lennon mother-of-pearl headstock signature, 70th Anniversary mother-of-pearl engraved 12th fret birth date of John Lennon, label personally signed by Yoko Ono, 1960s laminated Sitka spruce top, historic Gibson ladder bracing pattern, mahogany back & sides, custom thin lacquer finish, Jumbo 1960s frets, historic adjustable bridge, Gibson authentic P?90 pickup and a Gibson Custom Shop hardshell case. MSRP on the Museum model is $15,048. The custom shop’s second and third renditions are limited to 70 guitars each, one for every year since John’s birth in 1940, and both include a special 70th Anniversary Certificate personally signed by Yoko Ono and sent to the final purchaser by Certified Mail. Yoko One herself has been quoted as saying , â€œRemember, each one of us has the power to change the world. Just start thinking peace and the message will spread quicker than you think.â€ The Gibson Lennon acoustic models celebrate the peace that has lived on for years through John Lennonâ€™s music and Yoko Onoâ€™s staunch devotion to his memory and legacy. â€œTo say how proud I am of these new John Lennon Anniversary guitars is a huge understatement. The legacy that John Lennon has given music fans around the world is unprecedented and the friendship Gibson continues with Yoko Ono is demonstrated in these remarkable instruments that are in tribute to arguably one of the worldâ€™s greatest musicians,â€ said Henry Juszkiewicz Chairman and CEO of Gibson Guitar. It isn’t very well known that Journey guitarist Neal Schon had a “blink and you missed it” guitar company in the 1980’s. The most famous model is a single cutaway that was seen in the later Journey and Bad English era. Those models were made by the Jackson guitar company in 1986 and it’s estimated that about 200 were made. When disagreements between Schon and Jackson caused him to move on, Neal turned to Canadian guitar maker Larrivee. Acoustic Magazines Vintage Guitar expert, Paul Brett’s DVD sample on collecting vintage acoustic guitars. Paul is rated as one of the leading 12 string guitarists in the World and his ull DVD features 23 rare guitars, plus tips on collecting and sourcing these instruments. Vintage Guitar investing on CNN! Rudy Pensa’s interesting comments on investing in vintage guitars..
Carvin is an American custom guitar brand. They are not particularly well-known but to those â€œin the knowâ€ they represent high quality and reasonable value for what they are. 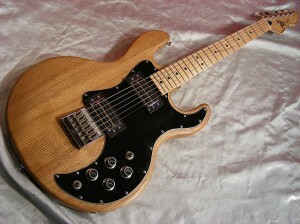 Many of Carvinâ€™s designs in their 1980s heyday employed through-neck construction, which is now established and used often. When Carvin started using it, however, it was in its infancy, having only been used previously on the Gibson Firebird and early BC Rich guitars. 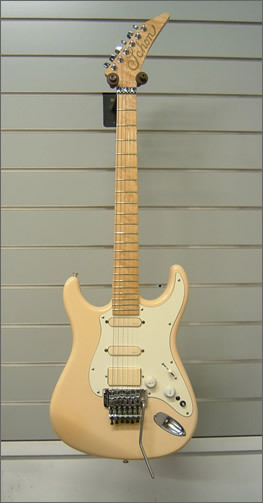 In the 1980s Carvin began to gain a serious reputation, and their guitars were used by Craig Chaquico of Starship, Jason Becker of Cacophony and Steve Vai before his endorsement from Ibanez. Their amps are also renowned, and Vai is a long-time user of his signature Legacy series. Many of Carvinâ€™s guitar designs are based on traditional shapes with their characteristic twists. 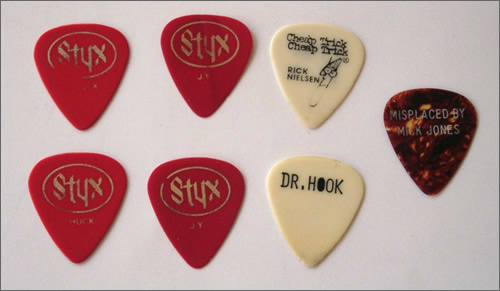 However, in 1984 they introduced a very different shape to their line-up, which actually became one of their most popular designs. That guitar was the V220T. 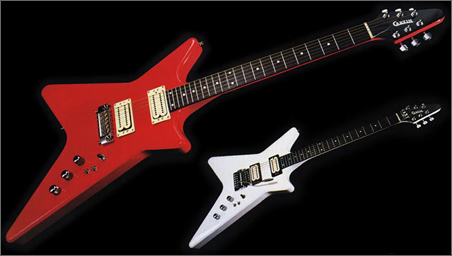 The V220â€™s shape was unique and could perhaps be said to resemble the bottom half of an upside-down Jackson Rhoads crossed with the top half of an upside-down Gibson Explorer. It is a surprisingly elegant shape, and was available in black, white and red as well as a clear natural finish. In terms of construction, the V220T consisted of a maple body and maple set neck, although quilted maple and koa bodies were options. The neck had 24 frets on an ebony fingerboard. 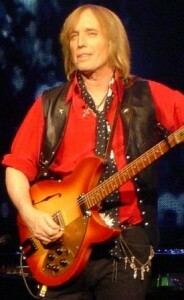 The neck was topped off by an arrow-shaped headstock resembling that of a Gibson Flying V.
The hardware was high-quality. The pickups were an M22 humbucker at the neck and an M22SD at the bridge. The pickups had twice as many pole pieces as normal, for more sustain. The pickups came with white covers and could be said to resemble DiMarzios. There were two options for the bridge. 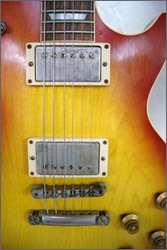 The standard was a one-piece fixed bridge/tailpiece combination. The more common option was the then-new Kahler locking tremolo system, which ended up on most V220Ts. In terms of the controls, there was a master tone control, volume controls for each pickup, a three-way pickup selector and two coil-split mini toggle switches. The V220 was a successful design which found favour with many significant rock players. It was discontinued in 1989 after a prosperous five-year run. It has since been reissued, however, and is in Carvinâ€™s current product line albeit with some changes. The shape remains the same, although the tremolo is now a Floyd Rose model, and the construction is thru-neck. The body is now alder and the controls have been simplified. The UK price of this new model, due to the higher-end features, is Â£1226 (quoted from Carvinâ€™s website, and converted from dollars) but original 1980s models go for surprisingly little. A trawl on eBay suggests prices in the region of Â£300-Â£600. Following on from the last post about the tragic loss of vintage guitars in the Nashville floods, Chris Spann fromÂ moneysupermarket.com has written this guest post to alert us all to the importance of making sure we keep the insurance up to date on all our treasured and valuable possessions, not just our guitars! Have you ever spent a little bit too much on a guitar? Every collector probably has at one time or another; it kind of goes with the territory â€“ along with casually changing the subject every time someone asks you how much youâ€™ve spent on your new axe. 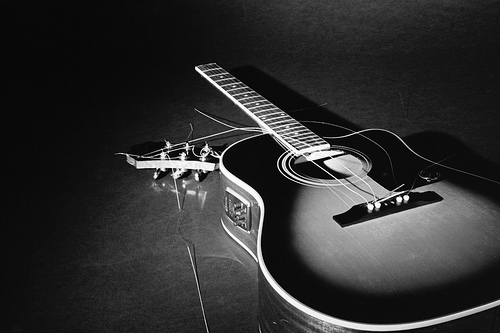 But imagine what would happen if that guitar was damaged in some way, or stolen: As well as the sentimental value, you could potentially be left out of pocket to the tune of hundreds, or even thousands of pounds. Be honest, when you add another guitar to the collection, do you update your home insurance? If you only buy two guitars in a year that could see your collectionâ€™s value increase by Â£1000 or more, and before you know it youâ€™ve got an awful lot of moneyâ€™s worth of wood and wire hanging around your house. Itâ€™s also worth finding out what your single item limit is on your home insurance;Â the last thing you need is to lose a prized instrument only to find that your provider wonâ€™t cover the full cost in repayment. â€¢	Fit five lever mortice locks and consider changing the locks â€“ if your house has previous owners, you donâ€™t know who might have a key. â€¢	Fit smoke alarms and give up smoking â€“ both of these things can decrease your premiums by a noticeable amount. â€¢	Install security lighting and a NACOSS approved alarm â€“ these will also help to slash the cost of your insurance. Obviously, things like this arenâ€™t only good for keeping your premiums down; theyâ€™re also great for making sure your prized collection of gear doesnâ€™t end up in the wrong hands as well. Most thieves are opportunists, and as such a security light or clearly visible alarm sounder box on an exterior wall can make them think twice about trying your home, which is often enough to keep your possessions safe. Too many people do not adequately cover their homes, which can make an already difficult time (dealing with the aftermath of a fire, or burglary, for example) all the harder when their provider refuses to pay up for possessions they have lost. Donâ€™t let yourself fall into this trap, and check your cover.